Although Radio Row at Mall of America is buzzing with interview after interview and hot take after hot take, the Twitter Sports team is taking a chilled-out approach. The social-media giant has erected a walled off “lounge,” complete with a couch and high-top meeting desk, that has proved an ideal space to both meet with valued partners and lure in talent to create Twitter-friendly content, such as GIFs and short-form on-demand videos. Who's going to win the game? I'm gonna go Patriots by 4. Twitter Sports is partnering with Colorado-based creative agency Fresh Tape Media, which is filming and editing the content onsite. The team is working with minimal setup, shooting with a Sony Alpha A7 that feeds right into a laptop for editing. The proximity to Radio Row has been beneficial for grabbing current and former players, commentators, and other personalities. On Tuesday and Wednesday, NFL quarterbacks Kirk Cousins and Deshaun Watson and CBS Sports sideline reporter Jamie Erdahl came through the set. The VOD content is being published directly to the Twitter Sports account, which boasts 15.6 million followers. Twitter Sports is partnering with Fresh Tape Media to acquire content at this lounge set near Radio Row at Mall of America. 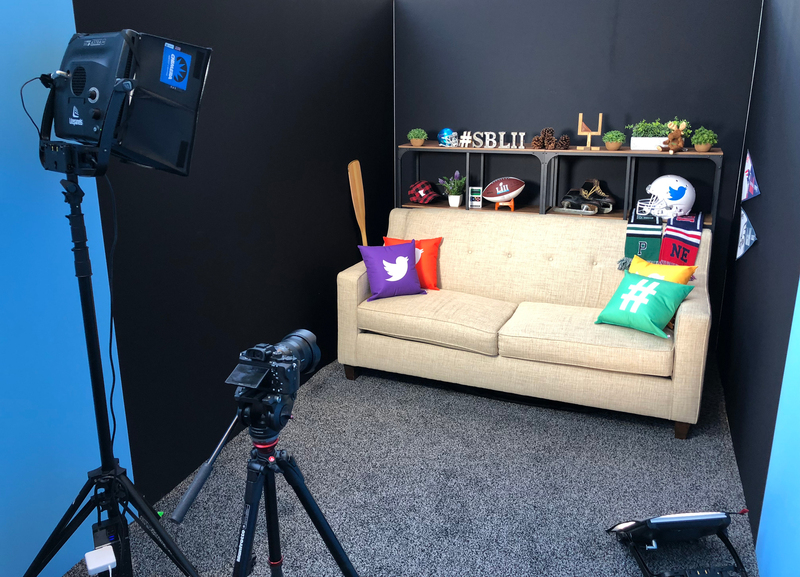 Although Twitter is not producing any of its own live video content at Super Bowl LII, it is supporting the efforts of a few of its partners. NFL Media is delivering its #NFLBlitz program, with which it has found success throughout the season; ESPN’s Double Coverage show is a Twitter-exclusive program hosted from the Hard Rock Café at Mall of America by Mike Golic Jr. and Katie Nolan. The New England Patriots’ 24/7 Not Done Network also has its own dedicated Twitter page, and DirecTV will bring Jennifer Lopez’s Saturday-night concert from Nicollet Mall to Twitter. Twitter’s Radio Row activation will run through Friday. Then, the team will shift over to support the NFL Honors show from the University of Minnesota’s Cyrus Northrop Memorial Auditorium on Saturday evening. That set has a more detailed winter theme, using multiple camera angles to build short-form looping videos. Also onsite here at Super Bowl LII representing Twitter Sports are Head of U.S. Sports League Partnerships TJ Adeshola and Global Director of Sports Partnerships Laura Froelich.